Sydney’s Voice services are performed by licensed registered nurses who have expertise in nursing and health care issues. All of them have outstanding clinical knowledge as well as significant experience planning, managing and coordinating care. Their experience and knowledge of community resources provide you with your own nurse advocate. The services of Sydney’s Voice Healthcare Advocates are available to individuals and families on a per-hour, private-pay basis. Sydney’s Voice accepts checks and credit card payments. 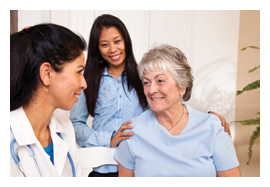 Be your guide and advocate during hospitalizations, outpatient procedures, rehab or nursing home stays. Monitor or address needs of a loved one for families who have difficulty taking time off work or for those who live out of town and need someone close by. Explain everything so you have a comprehensive understanding of your diagnosis and treatment options. Assist you in finding the right doctor, surgeon or arrange a second opinion. Accompany you at doctor’s appointments. Help with discharge planning, transfer to another facility and coordination of home care. Get things you need such as healthcare equipment and supplies. Resolution of billing, claims and insurance issues. Care management for special needs clients or elderly. Identify providers for services and long-term care placements. Coach you to better manage chronic health conditions.